Ever since the graduated probate fee was declared unconstitutional in Estate of Claeyssens (2008) 161 CA4th 465, the legislature has been nickel-and-diming estate planners and their clients with filing fees. Now we have to deal with multiple fees for lodging wills, which used to be free. Current filing fees include a $435 fee for “first papers” in probate and additional fees of $40 to $200 for other papers and special letters of administration. The latest is a $40 filing fee for a request for special notice in trust and probate proceedings and conservatorships. Last year, the legislature imposed a $50 fee on lodging a will with the superior court as required by Prob C §8200. The will must be lodged within 30 days after knowledge of the death of the testator even if no probate is anticipated. There’s no immediate penalty for failure to lodge the will, but the custodian of the will is liable for all damages sustained by any person injured by the failure. The term “custodian” is undefined but may include a person with no interest in the decedent’s estate, including the drafting attorney. allow the custodian to send a copy of the will to the named executor (and other interested persons) and then allow any person to demand lodging of the will by giving the custodian the $50 fee. When a probate is anticipated but no petition is filed within 30 days, it’s recommended that the attorney, executor, or other custodian lodge any wills in his or her possession (not only the last will) with the court clerk for safekeeping. This could get expensive. When a probate is filed within 30 days, it’s recommended that the executor lodge the will at the same time because the clerk may fail to check the safekeeping file and refuse to file the petition, thinking the will has not been filed. A certified copy of the will also may be needed as an attachment to the estate tax return. These days, even small estates may file returns because of portability. See Portability—Game Changer for Estate Planning or More of the Same? When might double fees be required? For lodging wills that were executed in duplicate originals. For lodging husband-and-wife wills on the survivor’s death. Duplicate originals are not recommended but some people have them. Under Prob C §6124, failure to find a duplicate original in the testator’s possession may give rise to a presumption that the will was destroyed by the testator with intent to revoke. So you’d better lodge both wills. A photocopy can’t take the place of a duplicate original. Lauermann v Superior Court (2005) 127 CA4th 1327. Joint wills are not recommended, so most married couples have separate wills. Often, no will is lodged on the first death. When in doubt, advise your client to pay the $50 fee and lodge the will, or do it yourself. You’ll sleep easier at night. 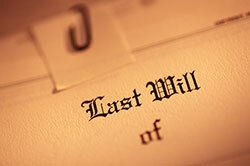 For practical advice on lodging wills, see CEB’s California Decedent Estate Practice §§1.37, 7.4. Also check out CEB’s award-winning California Trust Administration §§10.83, 13.60. On duplicate original and joint wills, see CEB’s California Will Drafting §§36.7 and 1.18, respectively.